The SL Ministry of Mahaweli Development, which comes under the direct supervision of SL President Maithiriapal Sirisena, has instructed the Divisional Secretary of Karaithu'raip-pattu and the fisheries sector officials in Mullaiththeevu district not to allow a disputed fishing ‘Paadu’, to be used by the fishermen. The SL ministry has come with a new claim that the area, subjected to a legal dispute for the last 21 months, as coming under the so-called ‘Mahaweli L Development zone’. 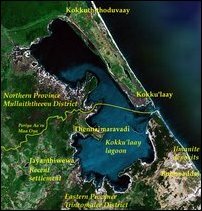 The occupying Sinhala fishermen have been opposed to native fishermen using the only Paadu (an area of coastal sea-bed falling within the scope of a draw net at 10 feet length), at the locality known as Padakuth-thurai in Naayaa'ru. 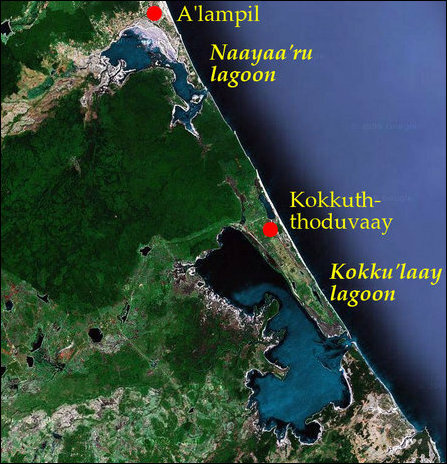 They have seized the entire coastal stretch from Naayaa'ru lagoon to Mukaththuvaaram in Kokku'laay, occupying more than 11 Paadus of Eezham Tamils in that division. The latest move by the Mahaweli authority has dashed the hopes of the native fishermen and it is a declaration of war against Tamil fishermen by the SL unitary state mechanism, the leaders of Kokku'laay St. Antonies Fisheries Society told TamilNet. The Sinhala fishermen, backed by the occupying SL Navy and various ministries in Colombo have been occupying the coastal strip, illegally calling their stay as ‘seasonal fishing’. They come in January and stay there until October every year since 2010. In 2011, Rajapaksa government gave ‘official’ permits to 78 Sinhala fishermen. Later, the number was increased with 300. Maithiripala Sirisena's government increased it further with 203 and now there are more than 1,500 Sinhala fishermen occupying the coast and the territorial waters of Eezham Tamils at Naayaa'ru. Realising the pathetic situation of Tamil fishermen, the local authorities identified one Paadu, at a coastal stretch below 500 meters, which was not used by the occupying Sinhala fishermen. But, the Sinhala fishermen started to confront the move and lodged a case against Kokku'laay St. Sebastian Fisheries Society. The Court hearing the case came with an interim order until final resolution. While Tamil fishermen were respecting the court order, the intruding Sinhala fishermen were engaging in fishing with the backing of SL Navy and the Sinhala police. Tamil fishermen evicted from their homes in 1983 resettled in 2011 after 28 years. The Sinhala fishermen were also unable to occupy the costal stretch of Eezham Tamils during the times of war. 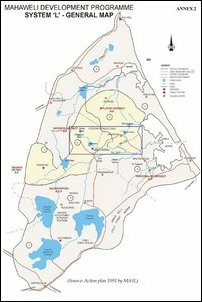 The SL Mahaweli authority now claims that the disputed land as coming under its domain. This is a targeted move to Sinhalicise the entire coast of Eezham Tamils, the native fishermen further said. Hailing from Polonnaruwa, Mr Sirisena has been implementing a long-term Sinhalicisiation agenda within the so-called System B targeting the East and System L targeting the north of the country of Eezham Tamils. Following video recorded on 18 April 2017, exposes the belligerent conduct of Sinhala colonists, who went to the extent of violent threat against the Tamil officials from Mullaiththeevu District Secretariat, Land Commission and Village Officers (GS) of Kokku’laay East and West, when they were instructed by the courts to conduct surveying of a disputed Paadu. “The countries that promoted SL State with giving more time and space at Geneva are complicit in the structural genocide against Eezham Tamils. You are all joining hands in destroying us. Tamils will be completely losing the coast of Mullaiththeevu within two years. The IC should not delay any further in bringing international justice,” Mr Ravikaran said in the video interview. 08.01.18 Sinhala Air Force, Navy compete with occupying Army in seizi..
11.08.17 SL Forest Department schemes Sinhala colonisation in Vavuniy..
06.04.17 Sinhala police attempts to evict Tamils from fishing Paadu i..
26.04.16 Emboldened by EU delisting, genocidal Sri Lanka bans Tamil f..
27.05.13 SL military appropriates lands of Tamils in Naayaa'ru, Mulla..